Dubai is well-known for it’s entrepreneurial spirit. The city thrives on a countless number of entrepreneurs. Not only in construction or the oil-industry, also in high-tech sectors like software-development there are leading innovators in Dubai. A small game-studio, Cambrian Hub Technologies, just emerged in Silicon Oasis, at the heart of Dubai’s tech-industry and launched a brand new word game that will easily win your heart and train your brain. 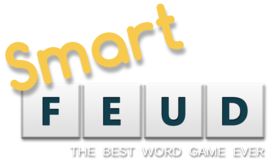 SmartFeud, as the game is called, is free to download for Apple and Android devices, and is based on the traditional Scrabble game, but comes with some unique twists that make the game much more interesting. SmartFeud is a social game you play against friends or random opponents. You can chat with your opponent, find friends through Facebook and play casually, since you’ve got 48 hours to make your move. Like Scrabble the objective is to play a word on a grid in crossword-style, and score as many points possible. But SmartFeud gives you an extra possibility: you can take a letter from the board and re-use it to your own advantage. This makes it a much more strategic game. Further more you can play SmartFeud with multiple opponents, and you can play in English, German or Dutch, while the company is working on adding additional languages.